Jeri was working as a waitress in a diner when she met Jim. She knew she was going to marry him right away. She already had two daughters, and he already had three. Together, they’d have one big blended family. It would be hard at times, but they loved each other, and their relationship was strong. Her only regret would be that they never had a child of their own. Read on to learn more about Jeri’s FamilyTreeDNA story. Then, Jim’s daughter Mikal called. Through FamilyTreeDNA, she’d found a sister no one knew about. Jim had another daughter. But she was in Vietnam. Suddenly, Jim realized the truth. He had served in the army, and was deployed to Vietnam when he was only 19. He became friends with the base’s “house girl,” and it turned romantic one night when she was forced to stay on the base. Then, a few weeks later, he was sent back to America. He never knew she was pregnant. Jim now had a daughter, Linh, he had never known about. They met online and talked over video chat and the families got to know one another as they tried to make up for lost time. Linh and her family in Vietnam made a big decision. They would leave everything behind and move to America as soon as they were allowed to do so. Jim and Jeri decided they weren’t going to wait. They packed their things and went to Vietnam to get her, and Jeri’s FamilyTreeDNA story continues. Jeri, Jim, Linh, and others in front of Linh’s coffee shop. 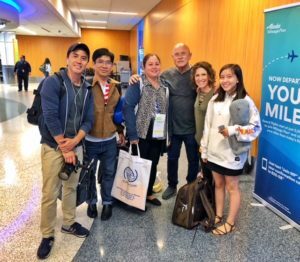 When Jim and Jeri finally met Linh and her family, it was an emotional reunion. They were overwhelmed by the experience of meeting Linh, her family, and the friends they had. They saw the life Linh had built for herself despite the hardships of growing up after the war while being discriminated against for being half American. Jim and Jeri meet Linh and her family at the airport. Despite all they had in Vietnam, Linh and her family were excited and ready to leave for America. A few weeks after Jim and Jeri had returned home, Linh’s visa was approved. It was finally happening. 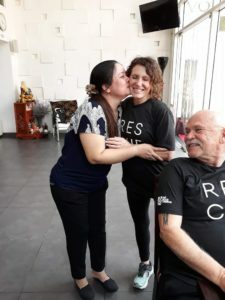 When they arrived, they were greeted at the airport by Jim and Jeri, who were eager to help Linh and her family start their new lives in their new home. Now, Linh and her family are adjusting to life in America, including her 17-year-old-daughter, Nhu, who is enrolled in the local high school. This is the beginning of a brand new life for all of them, and so far they’re fitting right in. For more success stories like Jeri’s FamilyTreeDNA story, explore Sandy’s FamilyTreeDNA story.